creative entrepreneurs do not have the option of avoiding these questions, when they are posed… if they plan to sell. Yes youare a creative… in thestudio. When you step into the “Fair”, you are a sales person… Your job is to sell the art. 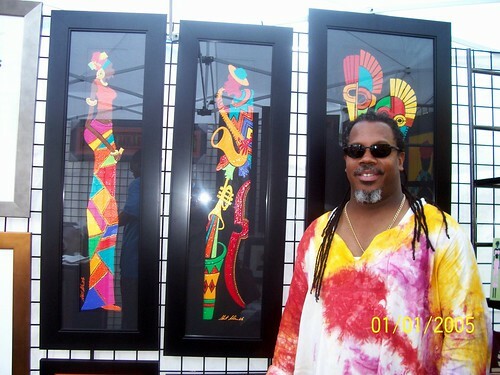 If this is difficult hire an agent or a sales rep.
“How to Talk to Artists at Art Festivals- The Do’s and Don’ts ” http://goo.gl/N9MdX. several times. I first ignored it and avoided responding, but I have a different view. I‘ve experience a lot of what was discussed, I even had someone go home and bring the “copy” they had made of a wearable art piece I had done to the second day of a Festival. What I did was take her number and teach her the technique. She eventually started selling lengths of fabric in this technique which I used sometimes in my line. They were different in execution from mine and added another option for my customers. Today I counsel Creative Entrepreneurs and one of the sessions preps them in handling these uncomfortable questions. As I read this again I felt the urge to highlight the opportunity. Frankly we Creatives, Artist designers need to get over ourselves and be of service to the customer. Yes we need to eat a bit of humble pie. There is a way to do so without losing ones dignity! First up hire an assistant so you are NOT stressed and tired. Make sure you have food and water at hand. a hungry artist is not a pleasant sales person and you need to be at your booth when the buyer is there. Get adequate rest… take a walk every couple of hours . That’s why you need an assistant. Can’t pay consider barter. Finally greet friends and family but keep the socializing for your studio or home. Stay off the phone and Social media, even when guest are not in your booth. It is NOT inviting when you walk into a booth and the person there seems otherwise occupied. I’m so sorry … we price our product so you get the best deal we can possible afford. What’s your budget maybe I can find something in that range or recommend a fellow artist who may falls within your budget. I’m sorry this is the original but we do have prints. #2 “Does this come in any other size/color? I do not sell prints but I will do commissioned pieces. REPLY:– Stop being afraid YOU studied the masters at college. “I teach this technique as well as creativity workshops to help you define your own style and have labs wher you can develop you skills, Take my card and give me a call or better yet leave your info with technique on my guest book and I’ll contact you. Unfortunately the process is not so cut and dry, we have to do research, drafts and aside from the actual art, their is like any other person the paperwork. REPLY:– what a wonderful idea, I’d encourage you to. In fact I (or a colleague0 offer some workshops that are great. Why not give me your contact email, and I’ll shoot you notes on these as they come along. REPLY:– – I appreciate your honesty… but art is a conversation, and in your very reaction there is a response, while I do not agree with your viewpoint, I surely do appreciate the fact that you took the time to respond! The atmosphere at art fairs or Pop up shops are can vary from slow and intimate to fast paced and “commercial”! Set the mood and keep in a positive mindset. Sure but you will need to make a refundable deposit that will be forfeited if it is not picked up by (give date on receipt). When someone inquires about a piece on hold. It is presently on view?hold for a customer. If you give me your info I will make an effort to clarify their interest and get back to you. If you want to open your mouth to speak be prepared for ANY reaction. Artist should have an assistant at the least a notebook and pen (attached). When you need them to move on politely say..
“I’m enjoying this dialogue and would love to continue this , why not connect on (social media channel) or leave your info and I’ll give you a call, or i’ll add you to my email list so I can invite you to a more intimate event! Targetted more towards the consumer. Consumers should Never take pictures of the art unless you ask the artist for permission first. Posted in Latest and tagged As I See IT, Selling Styles.